Indeed, a woman walking around in high heels is a good sight to behold. They also add confidence to the wearer. But, wearing high heels for long periods of time without any protection can subject you to long-term effects. You don't want those negative effects to plague your everyday life. As the popular saying goes, prevention is better than cure. One of those preventions is to wear the best insoles for high heels. 1 What happens when you wear heels for a long time? 2 How to choose the best insole for high heels? What happens when you wear heels for a long time? High heels, as you may already know, weren't originally made to be worn by women. Several decades later, the high heels we come to know today are the mark of a glamorous woman. Heels have become synonymous with fashion and sophistication. But, we can't also rule out that wearing high heels is part of the dress code in a company. We are not saying that you should not wear high heels anymore. But, you should wear them on moderation. Of course, even with protection such as orthotics, strutting all day long wearing them would show you the ugly effects later on. In a woman's anatomy, the wearing of high heels causes imbalance if the body doesn't react. This is because the balls of the feet take most of your body weight. Did you know that to maintain proper balance, a woman has to tense multiple groups of muscles? A woman has to compensate with intense pressure on the balls of the feet by tensing the chest, hip, and back areas. Furthermore, the spine becomes out of alignment as the lower back is pushed forward to support the lower body. To add to this, the knees feel more pressure than the usual when wearing heeled footwear. Long-term effects of daily high heel wear include the calves shortening and the thickening of tendons. The feet, back, and knees are strained more than enough which might cause deformation as opposed to the correct alignment. Each increase in inches on both heels also increase the pressure brought down on the balls of the feet. As an informational background, wearing 1-inch heels subjects the ball of the foot or the forefoot to a 22% of the body weight. At 2 inches, the weight subjected to those parts goes up to 57%. And then, at 3 inches, the body weight pressure carried by the ball of the foot or forefoot is at 76%. How to choose the best insole for high heels? If you can't avoid in wearing high heels, then, better gear up yourself. Not only you ought to do some stretching and exercises that focus on the legs, one should also invest in shoe inserts. The use of shoe inserts in a woman's heels is to add comfort and enhance the fit of the footwear. It's a strip of foam that looks different from the other insoles. Basically, heel insoles are designed for high heels. Moreover, depending on the brand you wear, the insoles can also alleviate pain and soreness caused by long periods of wearing. To know more on how to choose the best insoles for high heels, study the considerations we're listing below. Corrective insoles - This type corrects the foot while inside the shoes. It contains arch support to keep the foot in a more neutral position. Furthermore, they have additional features like antimicrobial and ﻿anti-odor. Cushioned insoles - Given by the name, this type is more on giving the aching feet more comfort. It's thicker, however, this type of insole changes the fit of the heels. Orthotic insoles - This type is typically prescribed by podiatrists. It aims to correct the realignment of the foot by correcting the bones for the foot. It also addresses certain foot conditions such as plantar fasciitis. Full insole - This aims to support the entirety of the foot and the most common type available in the market. Typical full insoles they may be bulky especially on the forefoot part but a heel insole is thinner to fit into narrow-shaped heels. Half insole - This one is halved support the heel in particular. It is less comfortable than the full insole as the head part doesn't have any support. But, the trade-off for this one is its adaptability. Three-quarter insole - This one only aims to support the heel and the arch, leaving the toe part unsupported. 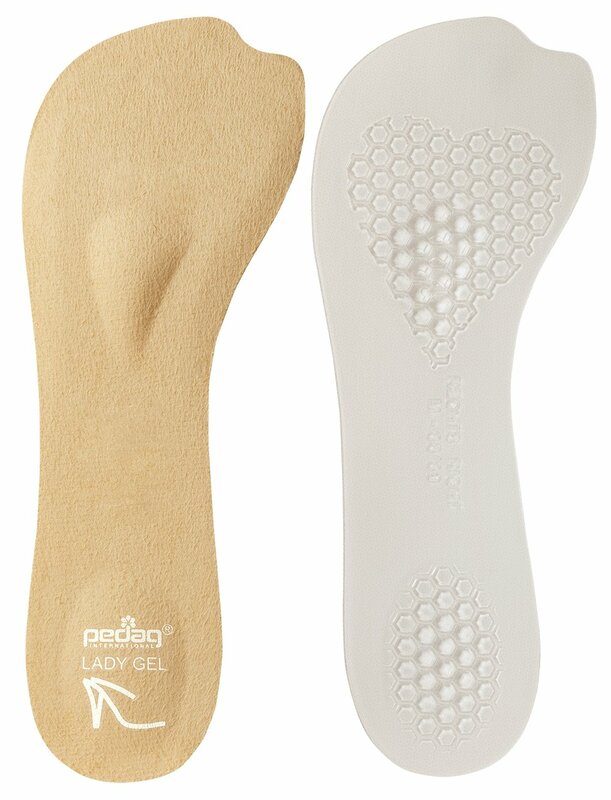 This insole prevents the heel from moving forwards if the size of the heel doesn't exactly fit the foot of the wearer. Furthermore, it can improve the distribution of weight along the entire foot. Detachable insole - This type has multiple layers. Depending on the wearer, they can adjust the height of the insole. The design can be full or half. Metatarsal pad - This one is specifically worn under the ball of the foot. It reduces the pressure on the metatarsal bones. Just like the typical insoles, the insoles for high heels are distributed depending on what material/s are used to make a pair. Rubber - the material used on insoles are either hard or soft. Hard rubber is for sturdier support to the feet and the soft rubber makes the feet more comfortable. Leather - This material is for those who need strong arch support. Furthermore, it prevents needless slippage of the foot inside the shoe. Gel - This material is soft and flexible. It allows more comfort to the feet than most materials. But, they can be expensive. Foam - The foam used on insoles is called memory foam where one takes the shape of the foot the longer you wear it. It feels more natural to the feet. Though there aren't as many brands for heel insoles as others that are used on athletic shoes or dress shoes, there are some which you can buy that are worth their value. Some of them are listed here. Dr. Scholl is a renowned footwear company that also specializes in foot care. Thus, it's not surprising that most of the products listed here are from Dr. Scholl’s. First on the list is the For Her which is a type of a ball of foot cushion. Wearing heels put the balls of the feet into strain. But wearing this one prevent it from getting more pain as there's ample cushioning on the underside. It's made of FabuSTEP Gel, a soft gel-like material. For Her is designed to stay in place and not cause any excessive movements especially when wearing it in your heels or flat because it comes with an adhesive. Essentially, it stops the foot from sliding forward. But, there may come a time that the adhesive will lose its stickiness. For Her is versatile and applicable to all kinds of women shoes. One great brand for metatarsal pads is Dr. Frederick's. The gel cushion comes in a standard size but is very versatile in catering different foot sizes. Furthermore, the cushion is super stretchy to provide extreme cushioning the foot needs. Dr. Frederick's met pad's main selling point is its ability to eliminate pressure points. In each step especially when wearing heels, the weight of the body becomes concentrated to the few parts of the foot anatomy. But by wearing one of these met pads, the weight is distributed throughout to give the foot the comfort it needs. Also, Dr. Frederick's has the ability to absorb shock and vibration. According to the veteran users, this met pad is best worn with socks for a snug fit. But you can also opt to wear shoes that are close to the actual size of the foot for a more comforting feel. Dr. Frederick's met pads are also reusable. They are easy to clean. But, one downside in this met pad is it makes the foot sweaty than usual. Happyfeet is another great ball of foot cushion worthy to be featured on this list. This product is different from others of the same type. Instead of flat all throughout, the gel is protruded at the center. This provides ample cushioning at the ball of the foot or the metatarsal head. Just like other insoles, wearing Happyfeet reduces the foot pain you have been enduring. This doesn't only alleviate the pain caused by long time straining of the foot but also those that are resulted from metatarsalgia, neuroma, bunions, and calluses. Happyfeet is washable whenever you it becomes dirty. It doesn't degrade rather easily. Moreover, the repeated doesn't fade the adhesive. This cushion pad comes with a self-stick adhesive that is compatible with all kinds of footwear. It's very easy to remove and attach. This is the first Dr. Scholl's foot care product that is specifically made for high heels. DreamWalk High Heel is part of the DreamWalk series of the brand to make ordinary shoes from flats to heels into more "remarkable comfortable ones"
This insole is made of ultra-soft gel that aims to shift the pressure off the ball of the foot. Of course, being a heel insole, the design is made thin to suit different designs of the heels. Furthermore, it won't make the shoes crowded with its three-quarter design. DreamWalk High Heel insole is for all high heels: 2 inches and higher. You can pick the size you want from 6 to 10. In using the insole, peel off the plastic backing of the product. Then, insert it into the heel. The underside contains a unique adhesive that won't damage the shoes. However, be careful in placing it as you smooth it down so you don't have to repeat the process all over. But, there's one downside with the placing of insoles into the footwear: the shoe insole must be made of leather or other smooth material except for fabric. 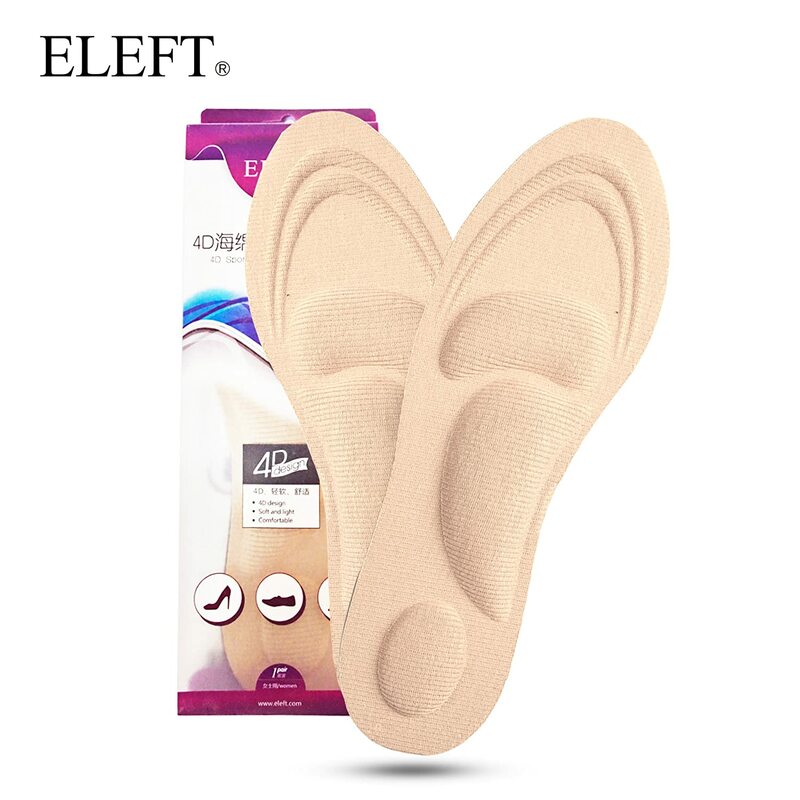 ELEFT is the insole for activities. It can support the foot where it needs most in many applications like jogging, running, ball sports, biking, etc. It can also be used by pregnant women who need to have extra comfort and support. The Barefoot Arch Support has the ability to reduce and even relieve foot pain that are caused by wearing heels or by foot conditions like plantar fasciitis, blisters, etc. This insole is made from a high-quality sponge-like material that is very durable, breathable, and lightweight. It also has anti-odor and anti-moisture properties. The supposed arch support feature may not be as accommodating to everyone else because of the rather flat surface. This combination of both gel and velvet material is not only applicable for heels but also for open-toed shoes and sandals. The Lady Gel-Velvety is made of a slim and thin design which makes it versatile on any kind of footwear. Depending on your preferences, you can trim the insole too. This insole features a velvety surface while below it is a gel cushioning. Furthermore, it comes with an adhesive so you don't have to attach some sticky tape or anything under it. The insole is removable and reusable. Just brush the surface with soap and water and it's clean again! Wearing Pedag's Lady Gel-Velvety insole doesn't incur any hardships that are felt in the past. It can alleviate the pain especially on the forefoot and the ball of the foot. Thus, wearing this makes walking in high heels more manageable. To install, peel off the backing and insert the insole heel first and smooth it down towards the forefoot. If you're looking for an insole for your pumps, look no further. 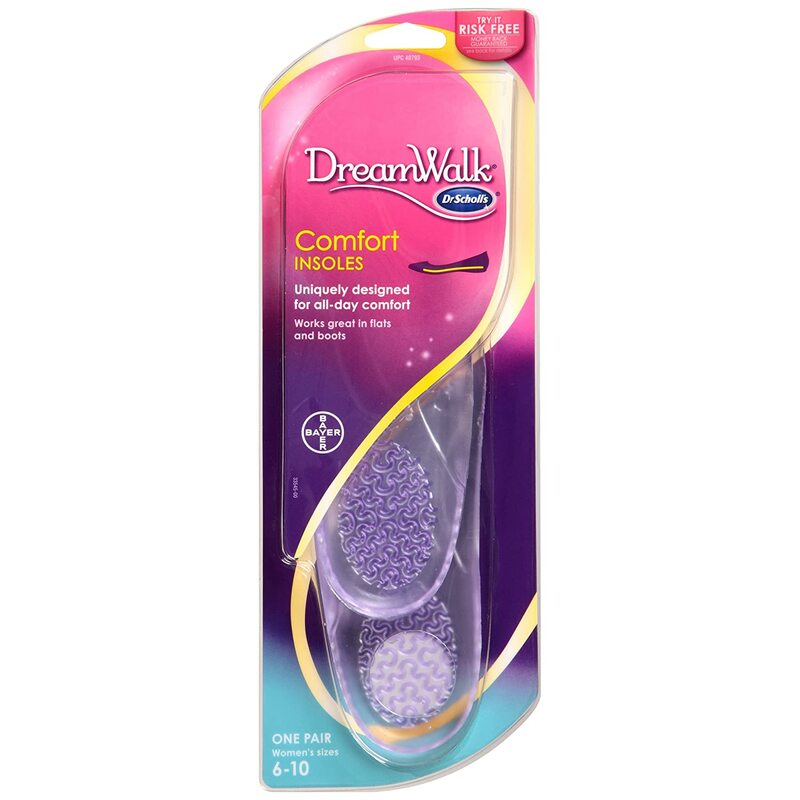 The DreamWalk Comfort Insoles by Dr. Scholl's can solve your problem right away. Aside from pumps, you can also insert them into your flat shoes. 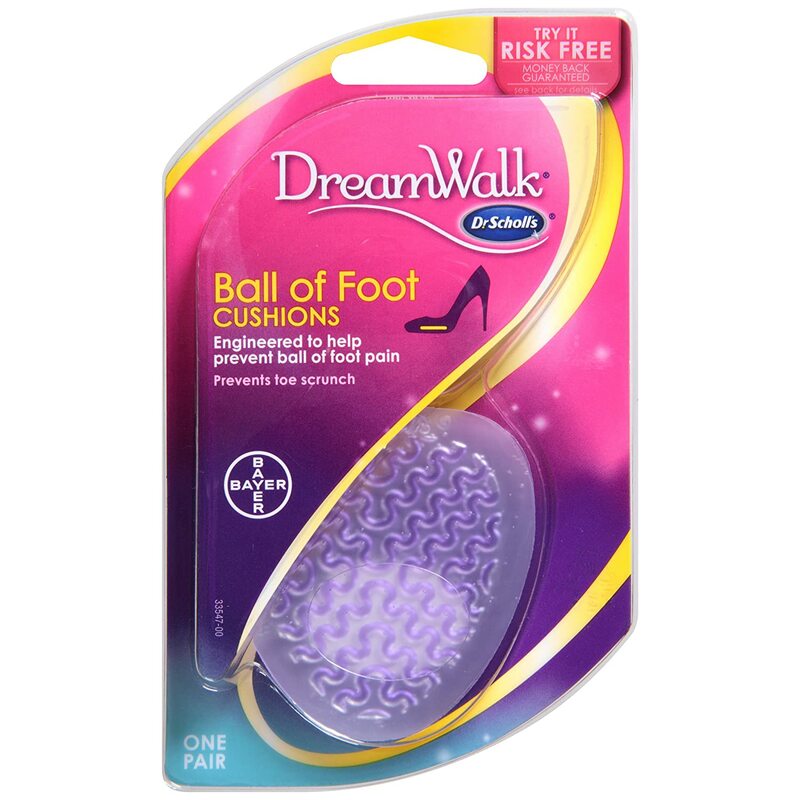 Just like most insoles in the DreamWalk series, the Comfort is designed for an all-day comfort with its gel material. There's ample cushioning on the underside of the foot giving you support aside from comfort. Furthermore, its slim design is perfect for different kinds of footwear as it won't make the shoe feel tight to the foot. One more advantage of wearing Comfort is the shock absorption. The way to insert the insole into your shoes is by peeling the adhesive and start sticking it into the shoe at the heel first. Another heel insole is Bringsine's. It reduces foot pain by alleviating the pressure on the forefoot. The soft gel material cushions the heel. The material is also reusable. Moreover, the pressure points are spread throughout the foot to transfer the pressure from the strained foot parts more evenly. The slim design of the insole makes it applicable for use in various footwear like pumps, open-toed sandals, and high heels. 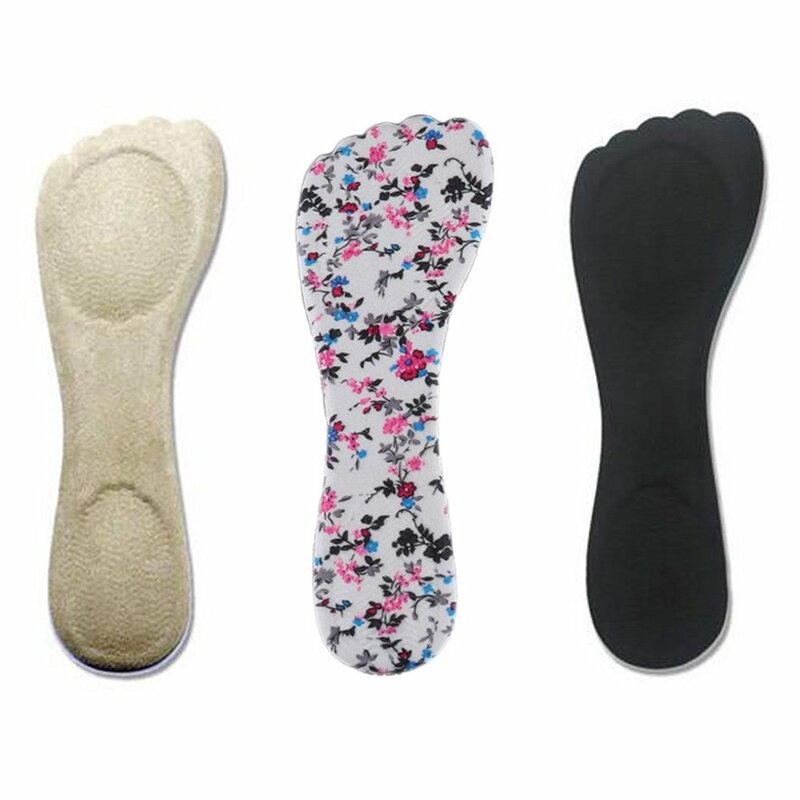 This three-quarter insole is applicable to all types of heels because of its slim design. It stays in place with its adhesive. It comes with a soft padding that can relieve stressed foot. Though not made of gel just like most heel insoles, its leather liner comes with a special metatarsal pad. This means that the metatarsal has extra cushioning to relieve the pressure on that area. The leather insole also helps prevent the foot from slipping forward. The second and last metatarsal pad in this list is by Dr. Jill's. Though not as great as Dr. Frederick's, it has its own good qualities. Felt targets the ball of the foot with its wide base. It comes with a self-adhesive padding which prevents sliding while inside the heels. The met pad comes in very thick cushioning which, in turn, provides very comfortable feeling at the underside. In fact, you can trim the pad to make them fit better. The downside of this met pad is its sticky surface. The best insoles for high heels are those that can add more comfort and take off the pressure on the aching parts of the woman's feet. So ladies, pick the heel insoles that suit your preferences best and you can widen your pool of selection more through the guide above.